Roz Savage is currently on the final stage of her solo row across the Pacific Ocean. You can keep up with her progress on this live real-time tracking Google Map. Roz, a British ocean rower, is attempting to become the first woman to row solo across the Pacific. In 2008 she completed Stage 1, becoming the first woman ever to row solo from California to Hawaii. Currently she is on the final stage of her epic journey. 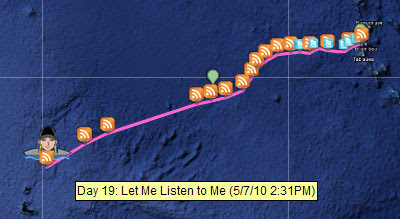 The map shows Roz's current position with links to her blog, videos and pictures of the journey. You can also view an impressive array of statistics about her journey directly from the map.